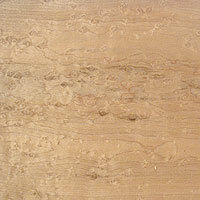 Birdseye Maple is a truly exotic species, if only because of its rarity... or at least the very best, selected pieces. The wood is of course hard maple, but for reason, yet to be clearly understood, in some rare cases the tree grows little "eyes" throughout the wood. The eyes can range from 1/8" to 3/8" in diameter, and vary significantly in density from a few eyes per board to 3 or 4 eyes per square inch. This figure exists both in the pure white sap wood and in the darker streaked heartwood, creating quite the drama. This is a regular birdseye, but the maple includes the various colours of the heart stock, so instead of being a background of plain white it often has fasinating grey, redddy brown or black streaks. Each piece is different and some can be quite dramatic.